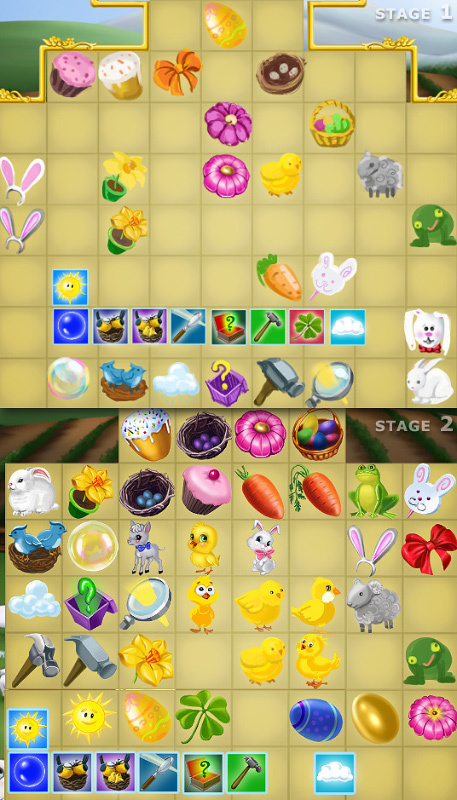 The task sounded simple – he needed some art for his new Easter-themed game which was based on his Holiday Bonus engine. 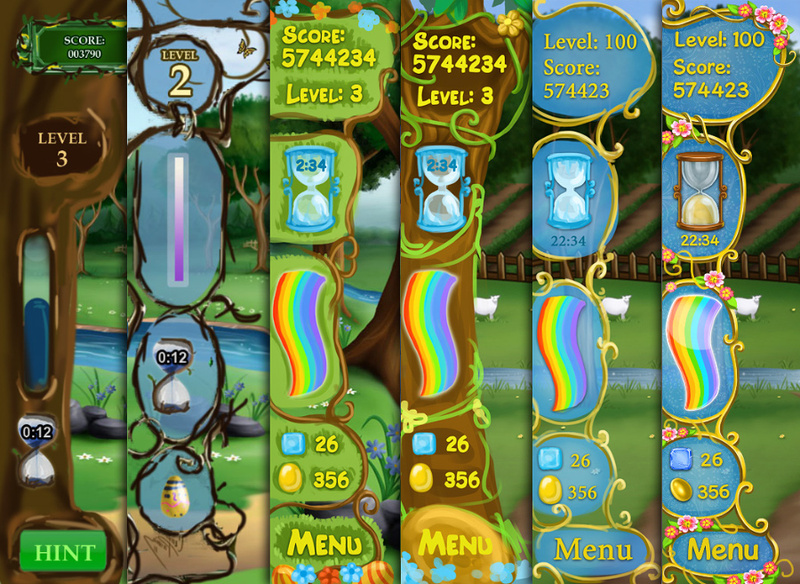 But as with any development – list of final items was slightly updated and reworked during art and game production. And while originally it looked like relatively simple job it was ended as pretty complex task, especially taking into account really short deadline. 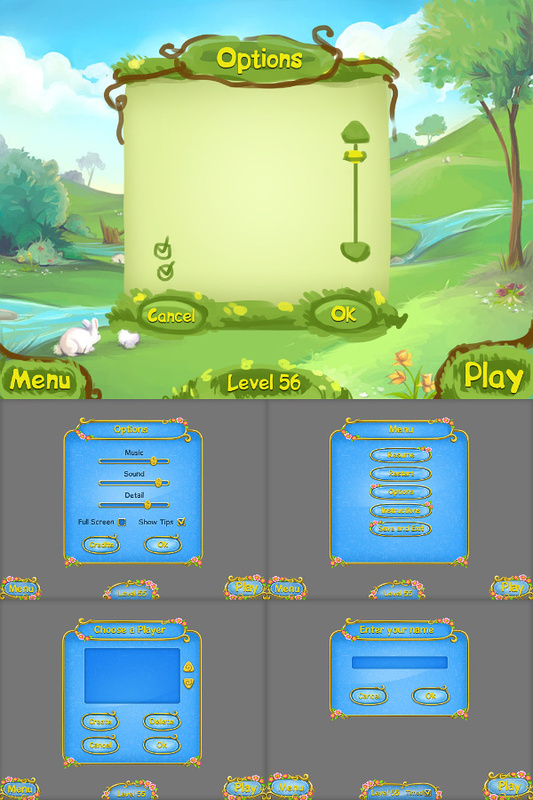 As usually, we started with some rough concepts for the game-field and game’s interface elements. We tried to fit our first tries with backgrounds created by other artist and spring atmosphere we were feeling, but in final art direction was changed to something more generic, less stylized but still nice and cool looking. Partially GUI was inspired by Season Match. Originally it was planned to use pre-rendered 3D elements for all the game-field chips, bonuses and probably tiles. Jake wanted something similar in terms of style to his previous Holiday Bonus game. We like 3D and do it nice, but for consistency and cuter look prefer to use hand-drawn 2D art for casual games we are working on. And while 3D can save some time if you need cute animations (Jake planned to have them) it requires a bit more time to create 3D model itself and balance final visuals with 2D environment. Because of that and also because of tight deadline we suggested Jake to go with fully hand-drawn graphics and leave misc animations as optional work for later stage. 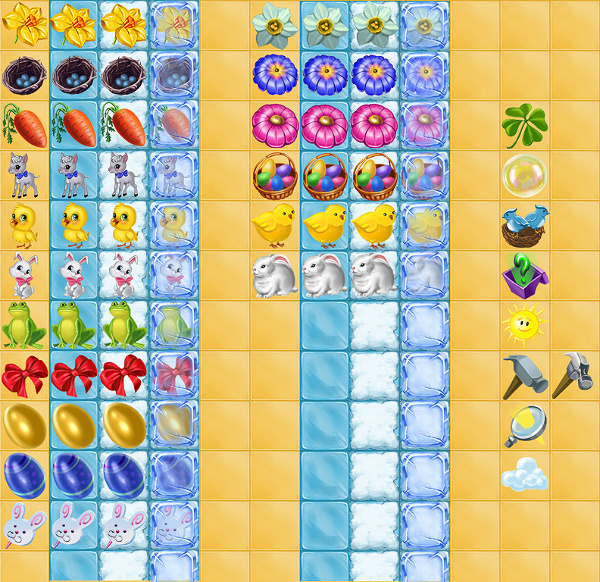 Tiles were based on the idea of melting snow/ice and it was planned to use the same idea for backgrounds originally. They should be changing their state from frozen winter images to warm spring scenery, but in final there was no enough time to implement that idea both in code and art. 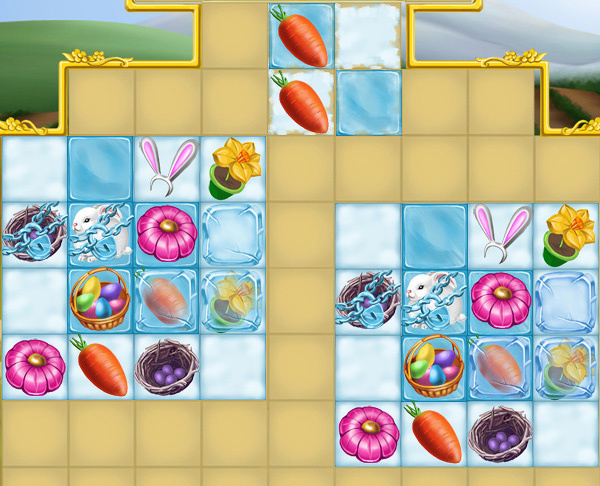 Final set of match-3 chips, tiles and bonus icons created by our team. 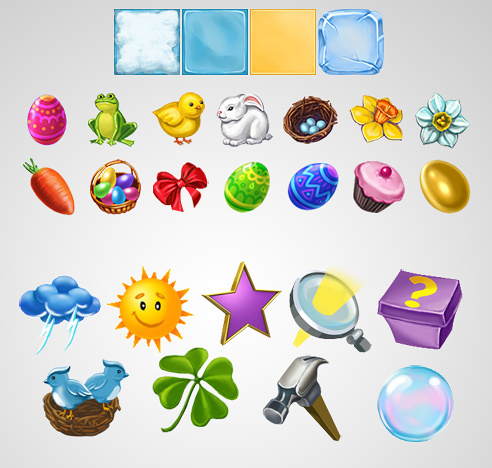 After Spring Bonus main GUI elements were chosen and polished we proceed to creation of universal constructor for windows, buttons and other interface elements. Simultaneously we were working on probably most important game’s thing – Logo. From a couple of ideas Jake chosen the one of blue color, which reads and stands out well. 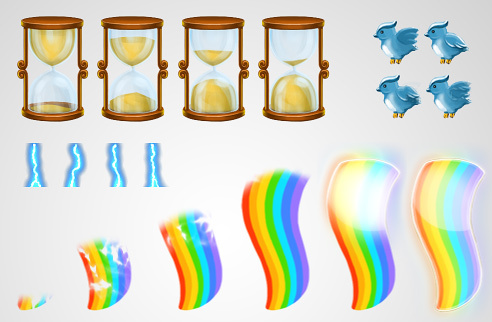 Additionally we created sand clock animation, rainbow power-up indicator animation and couple of other misc animations. 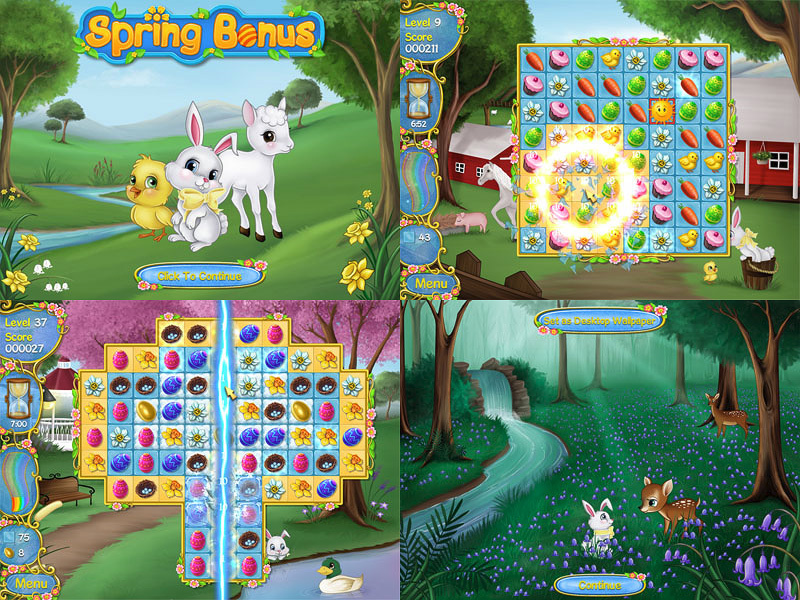 Currently Jake is finishing porting of Spring Bonus to other platforms (such as Windows mobile and iPhone/iPad) and we are helping with some miscellaneous work needed for that.